With September just around the corner, let’s stop for a moment and show our appreciation for the month of August 2017 before it is forever gone. August is usually a stuffy, sticky month when everyone is on holiday and, unless you have the aircon on at all times, you are constantly at risk of melting into a large puddle on the floor. That is unless you live in England where August is the month when autumn fashion comes in earnest to the shops and when cold rainy days alternate with an unexpected heatwave or two, so it is perfectly acceptable to have an angry red tan with oddly shaped tan lines under your jumper or coat. Plus, it is the month of the last for the year bank holiday and also the month when people start booking their Christmas celebrations and office parties or, at least, start worrying that they haven’t booked them yet. For me, personally, Christmas is really far away still. I haven’t even thought of Christmas once yet. That’s it unless, of course, you exclude the above paragraph where, in order to write it, obviously I thought of Christmas for a fleeting moment in time. On the other hand, August 2017 will stay in my personal memory as the month in which I completed three years of living in Italy. Here is to another two or three or four more! It has been a hot, hot month for me (all weather-related-wise) with the exception of a very strange day when the temperatures dropped by 20-25 degrees Celsius and a torrential rain came down on us during a day we spent in Sofia, the Bulgarian capital. I will forever remember this day for the strange dealings we had with several taxi drivers in Sofia. As it happened, it turned to be a really difficult thing to get a taxi from point A to point B. That is unless you were prepared to pay three times more than the established fee just because that particular taxi driver thought that the distance we wanted to hire him for was too short, hence we had to generously recompense him for the effort to drive. Plus, at different times through the day quite a few several taxi drivers refused to take us on, for no obvious reasons, I am telling you, we look perfectly trustworthy and normal. So, all I can say is: Sofia, sort your taxi drivers out! Anyway, this was just one sorry, miserable day of the otherwise glorious month of August 2017. I spent half of it in my hometown of Varna in Bulgaria and the other half here in my current city of Vicenza, Northern Italy. I had the chance to travel around and see many wondrous and beautiful things. For this I am feeling truly grateful. And I also received some quite shocking news about a tooth of mine, which will now require me to visit a very swanky dental clinic here in Vicenza over a long period of time. I am still coming to terms with how much this is going to cost me. Ah, the shock! Plus, August also saw the restarting of my blog. Huzzah! In any case, the best thing which happened to me in August 2017 was the number of times I actually went to the beach or the swimming pool or, even, the aquapark. I have never really been into ‘beaching’ that much. You know, the act of taking yourself to the beach with bags stuffed with thousands things and then spending the whole day there sunning yourself to the point of burning to a crisp. This summer though I suddenly discovered the joys of going to the beach/swimming pool/aquapark. In all honesty, I spent about three times longer in the water than on the sand, so it was more like an ‘active beaching’ rather than a ‘lazy sunning beaching’ for me. Still, just the act of being out there, close to the sea/water and under the generous rays of the sun gave me so much joy and filled me with so much newly discovered energy. It was really nice. ‘Nice’ doesn’t really cut it though, so I will say it again: It was glorious! So, to finalise this blog post, let me tell you a bit about the picture above. This is one of the centrally located beaches in Varna, Bulgaria. You can see how nice and blue the water is. I gather most people seeing the Black Sea for the first time are always surprised by how stunningly blue it actually is. 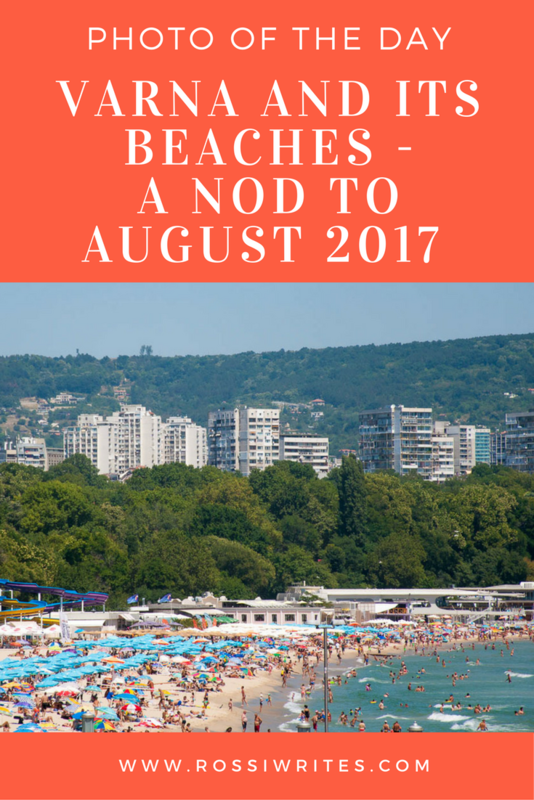 I really wanted to take a picture showing Varna’s beach life and I tried several times to capture it during our two weeks there in the first half of August 2017. I think, I finally succeeded with this photo, although, technically speaking, it is far from perfect. I like how it shows that the beaches are in the heart of the city. I like that it shows how busy the beaches can get. I like that it shows some of the mastodontic blocks of flats which are so typical for Bulgaria nowadays. I took this photo from the command centre of a military ship. The story goes like this: A couple of days before 15th August (which is celebrated as the Day of Varna), some Bulgarian military ships were anchored at the Sea Station in the city for the citizens to visit them as part of the festivities. We went, too. Actually, we went to visit the Rainbow Worrier – the ship of Greenpeace – which was visiting Varna at the same time and the military ships were anchored right next to it, so we went to visit them, too. From the command room of one of them, there was a great view towards the beach flanked by a line of trees and the blocks of flats. I did my very best to capture it into the perfect shot. I didn’t quite succeed, as the glass of the command centre was really thick and produced a lot of reflexions plus it sort of dulled the image, too. In any case, I happily look at the image above and reminisce of the great time we had in Varna, the lovely beaches/swimming pools/aquaparks we went to both in Italy and Bulgaria, and, above all, of the almost fabulous month of August 2017. Now, tell me, how was August 2017 for you?